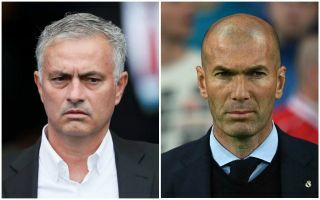 Spanish football journalist Sid Lowe has slated the idea of Zinedine Zidane being drafted in to replace Jose Mourinho at Manchester United. The Red Devils have got off to an abysmal start in the new Premier League season, losing back to back games against Brighton and Tottenham to fall six points behind the front-runners just three weeks in. Many experts and supporters have suggested that Mourinho might be on borrowed time in his role as manager amid reports of a discord with the players behind the scenes and a fractious relationship with club chief executive Ed Woodward – as per the Daily Mail. During his two-year spell in Manchester, the Portuguese boss has managed to win the Europa League and League Cup as well as secure the club’s highest league finish since Sir Alex Ferguson left in 2013, but his tactics and preferred playing style have often been called into question following a number of dour and uninspired performances from his team. According to the Manchester Evening News, Zidane has been lined up to replace Mourinho but Sid Lowe believes that if the club does indeed follow through in a pursuit of the Frenchman, they would be making a big mistake. He addressed the subject in an interview with ESPN, saying: “I don’t see the logic of a manager that doesn’t speak English, I don’t see the logic of a manager with no real connection to Manchester United. “With this United I can sort of believe it. I can believe that they would think ‘big name, that’ll do’ and it does sometimes feel like that is all they are driven by. Zidane certainly has the pedigree to be considered for such a huge role, given the fact that he managed to win four Champions League titles during his time at Real Madrid, but Lowe raised some good points in his sit down with ESPN which bring up the fact that he would face a much tougher challenge at the helm with United. Mourinho is clearly struggling to get the best out of his players, but then, he doesn’t have the likes of Cristiano Ronaldo, Gareth Bale, Luka Modric and Sergio Ramos to call upon. There are still some very talented players at Old Trafford but the gulf in class between the two clubs is massive at this moment in time, which means bringing in the French maestro would be by no means a guarantee of immediate success. Check out the full ESPN interview below for more on this fascinating topic of debate.